I knew Janet was sick but I didn’t think she could possibly die. In my mind she was immortal. Janet was always a delight to see and foremost to talk with. Insightful and funny, each encounter was memorable. She was also my favorite local painter. I fell in love with a painting she had at the High Falls Gallery, the one with her brother in a vortex entitled “Ooops!” It had a $200 price tag on it and I will forever regret not taking it home. 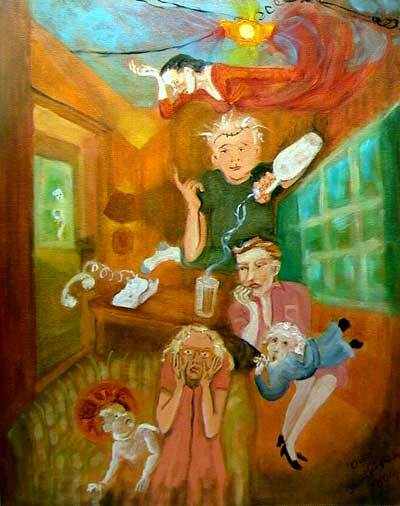 For years I maintained a web page of her paintings. Ten years ago she sent jpegs of her latest batch along with this note. I never got around to posting them. “The whisk broom and dust pan are from my Primordial Fleamarket Series. I allow one object per canvas, life size. I want them to appear to be in process of being made, like in a geological rather than a manufacturing process, with the varying layers of paint mimicking aeons. The typewriters, lamps, sewing machine and guitar are also in this series. I’m working on a 1896 Fairbanks Banjo at the moment. Janet wrote the following introduction to her paintings on the site. “I seem to always want to paint either my kitchen table, or the view out my window of Pinnacle Hill. Pinnacle Hill has been encroaching upon, interfacing with, and persistently stepping up its allurements to me as an interior artist. I’m taking it one step at a time. I only want to paint it through the windows and ceilings of my house, with all its seas and deserts and nebulae, and its population of cowboys and saints, horses, maybe soldiers, sharks and flying dogs also. 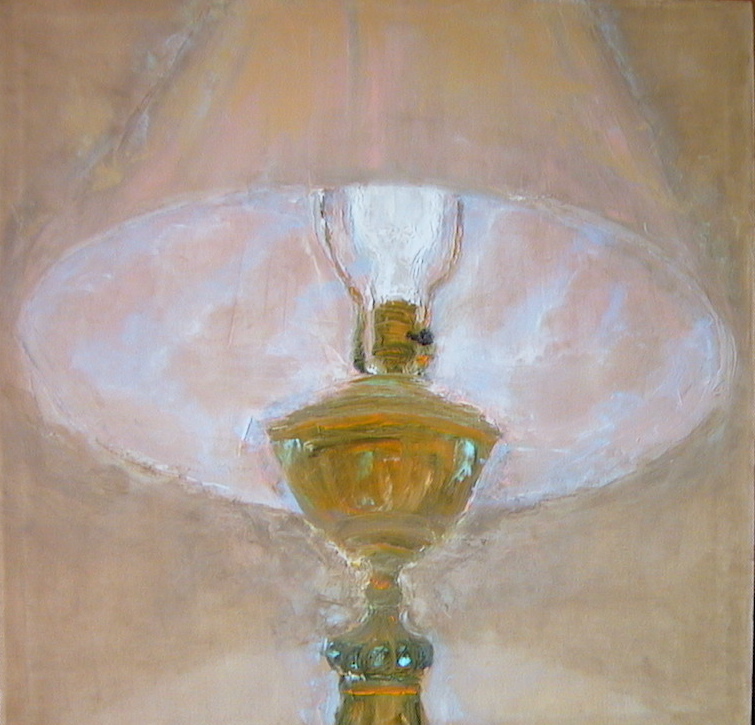 I am allowing my paintings also to “borrow,” shall we say, from the images of other artists. For example: the one of the Sea of Galilee Lapping the Shore of PS 35, shamelessly appropriates from Delacroix. But Lawrence Lazarus’ Battered Blue Cube is in there, also, in quadruplicate. School 35 is a low brick building with seemingly no appeal, yet with 4 or 5, (I really haven’t counted them) blue doors, Battered Blue Cubes! They were painted beige for awhile, a while back, and my heart sank. I was wracking my brain for a way to convince myself that my memory of their blueness would serve me just as well, as an artist who knew something and could brook all obstacles in her path, when they got painted blue again! like a miracle, in answer to a prayer I didn’t dare send up! The one of the Fight for the Waterhole at PS 35 borrows (HA!) from, as you can guess, from Remington. But, again, the doors of school 35 are DEFINITELY Lawrence Lazarus’ Battered Blue Cube. He probably wouldn’t have seen the point of there being 4 or 5 of them, but that’s how it is. My latest painting, Pope Cake, is the Pope and my mother at the kitchen table, with a Thiebald wedding cake on the table, and the table holding its own, if I do say so myself! It’s really a picture of my mother’s arms, I think. They express her earthy fretfulness, without giving up a bit of her translucent leaving this earth quality. It shocked me. At one point she and I had a deal with a publisher to do a series of children’s books, something I’ve always regretted not doing. She was a remarkable human being and my favorite area painter; more honestly, one of my favorite painters, period.